Hey UE developers! A certain vr project of mine needed the ability to peek into archives and extract them efficiently and I couldn't find any good zip solution for UE4 so I decided to port 7zip, update it for VS2015 and make it easy to use. I hope this will be useful to some of you . If you can improve it, please make pull requests! 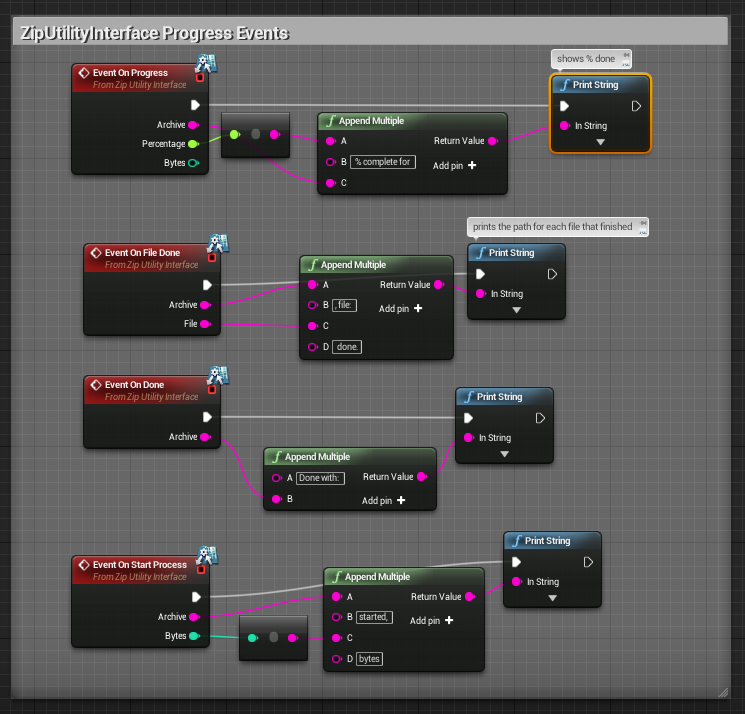 An event-driven, multi-threaded, C++ & blueprint accessible 7zip archiver and file manipulation plugin for Unreal Engine 4. Built on 7zip-cpp modernization of the SevenZip++. Supports the following compression algorithms: Zip, 7-Zip, GZip, BZip2, RAR(decompress only), TAR, ISO, CAB, LZMA, LZMA86. Plugin works in Windows only. Create new or choose project. Copy Plugins folder into your Project root. Restart the Editor and open your project again. Plugin is now ready to use. Note that the event callbacks are optional and are called asynchronously on your game thread allowing you to easily show a progress indicator. The plugin can handle Zipping, Unzipping, Listing contents, Making Folders and Moving/Renaming Files. For more documentation, read the github repo readme, the main source of documentation. -Thanks to #4 (@hyperdr1ve) the plugin now supports multiple simultaneous operations working independently on their own threads with proper callbacks. -Merged UnzipWithFormat with Unzip. Compression set to unknown will auto-detect compression. -All callbacks now return with the archive path, allowing you to distinguish between simultaneous actions. -Fixed callback consistency, unzip and zip will emit all progress updates and list callback will return with OnDone when listing has completed. Last edited by getnamo; 05-09-2017, 02:47 PM. This is really, neat! I have been thinking about dealing with zipped files and unreal but decided to not bother (as it never got to the point of needing it). Awesome utility, now ill have to check it out! Let me know if you think anything is missing, feel free to modify/make pull requests. Cheers! Not quite comics, although that sounds pretty cool. It's more to do with automatic download and checking if they're VR experiences and moving them into place/etc. If you're interested in the use case, keep an eye out in the Nexus thread. I'd love to see Nexus support Hydra and other motion controls in addition to Leap Motion. The plugin modifications and 7zip-cpp are MIT, SevenZip++ is public domain. You can comment one line of code to remove the Unrar restriction using 7za.dll instead of 7z.dll by changing line 138 and 139 in ZipFileFunctionLibrary, this will however limit your archive support to .7z only due to how 7za.dll is compiled (you can in theory re-enable everything but RAR, but you will need to recompile a compatible 7zip dll yourself using the LZMA sdk which is public domain), for my own purposes the unrar restriction is acceptable and I prefer the wider archive support so I default to 7z.dll. Regarding LGPL, because this plugin is using the com-like port interface to the 7zip .dll it doesn't cause the rest of the code (e.g. modifications and any unrelated code) to fall under LGPL. From the wiki on LGPL: a standalone executable that dynamically links to a library through a .so, .dll, or similar medium is generally accepted as not being a derivative work as defined by the LGPL. It would fall under the definition of a "work that uses the Library". Paragraph 5 of the LGPL version 2.1 states: A program that contains no derivative of any portion of the Library, but is designed to work with the Library by being compiled or linked with it, is called a "work that uses the Library". Such a work, in isolation, is not a derivative work of the Library, and therefore falls outside the scope of this License. While not relevant, that dll barrier is actually another static library (7zip-cpp) away from the plugin in release mode and another dynamic link barrier in editor mode (this plugin .dll). It may be not trivial to parse but you are ok with using this plugin commercially with the license file included, that said I'm not a lawyer and you should make your own judgement, refer to the plugin license file for details. Last edited by getnamo; 01-06-2016, 06:26 AM. This update brings fixes from 7z-cpp and improves the reliability of callbacks. You can now also call simultaneous actions and distinguish between results and progress updates via the archive path string parameter attached to each callback. New file manipulation functions (delete file/folder) allow you to clean up temporary files e.g. an archive after you have unzipped. UnzipTo function allows you to unzip to a different location than where the archive is present. Note that DeleteFolderRecursively can be dangerous, but it shouldn't allow you to delete outside your game directory (basic sandboxing). Also changed git structure to better follow distinction between source and releases, testing the waters to see if this is more easily maintainable than what I was doing earlier. Last edited by getnamo; 01-17-2016, 09:11 PM. Any clues as to what is going on? I've tried all changing all kinds of plugin/Engine settings but can't get it to work. I see that CAtlBaseModule is a Windows thing, but not sure what to do with that information. Seems to be that we're missing links to atls.lib (https://blogs.msdn.microsoft.com/mik...winmoduleinit/) or some form of basic windows lib/dependency. The plugin uses some windows specific functions to move files around (convenience functions found at https://github.com/getnamo/ZipUtilit...brary.cpp#L398), if you're not using them you could disable them or consider maybe finding a good pull request to make it less windows specific? Otherwise the lib dependency needs to be resolved. Great. Looks like we did the same research on this one. Thanks for pointing out where the windows functions are being called. I'm changing my strategy and am not using the plugin anymore (for a host of other reasons not related to the plugin itself), but it looks like a solvable problem. @Getnamo - I get a crash if I hit play in editor, do some unzipping work, stop, then hit play again. Seems like the thread isn't cleaned up always when ending the in-editor play. Thanks for this btw, it works great for my comic book reader. Last edited by n00854180t; 08-21-2016, 02:52 PM. Got any logs for when these crashes happen? A few files appear to be missing for me. Is this @ the latest master branch commit? Might be that the pre-requisites are desynced. Let me know which version is broken and I'll have a look.